Tired of cigars with slow beginnings and harsh finales? Cut straight to the sweet spot with NUb! This is NUb by Studio Tobac, the most innovative branch of the legendary Oliva Cigar Company. 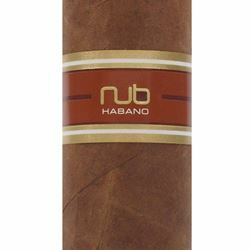 NUb debuted in 2008, becoming one of the first cigars to capitalize on the growing style of large-ring-gauge formats. But Studio Tobac didn't stop there, the company then found the cigar's most flavorful portion and cut the length to only highlight this section—meaning every smoking session is truly "nub worthy." NUb Habano offers a classic blend, beginning with a Cuban-seed Nicaraguan Habano wrapper and followed by all-Nicaraguan binder and fillers. Smokers can expect a medium body and a focus on flavor intensity, including loads of cabinet spices, freshly cut cedar, medium-roast coffee beans, and roasted nuts.